Wagon Lane slalom site is located on the River Aire in Bingley, West Yorkshire, and is home to Bradford and Bingley Canoe Club. The site is part of the Bradford and Bingley Sports Club complex. An easy grade 2 river, the course is ideal for beginners and Division 3 paddlers who will find enough challenge and interest to test their skills. The course offers opportunities to try all the standard moves and to demonstrate sprinting prowess on the deeper, slower, sections. A natural river in an area prone to rapid rises in water level, the water can vary by as much as four feet within a period of days and change from a rocky, boulder- strewn river to a full-on surfers' paradise. The course begins with a flat, shallow 20m wide clear water stretch before dropping down shallow rapids to the Nibbler - a smaller version of the infamous Muncher at Nottingham. A 20m run then follows taking upstreams in safe eddies left and right on the way down to the "S" rock. As the name suggests, movement around the rock usually takes the form of an S move from either direction. 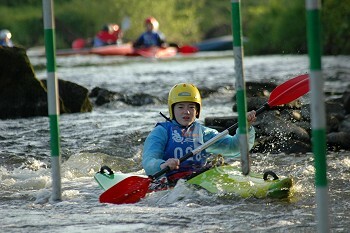 The river then deepens and slows, allowing competitors to show their sprinting skills, and sweeps between downstream gates before passing the club boat store and steps. The final section is on steady and safe water before a final sprint to the line approximately 200m below the start gate. 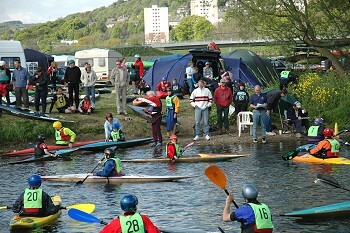 The annual slalom in May is always well attended and attracts a loyal band who appreciate camping by the river, a good social weekend and the chance to visit some of the attractions in the Aire valley and Dales National Park.